So, despite the name of this blog, I actually don’t eat baked goods for breakfast, lunch and dinner. One of my favourite other things to cook is pasta. 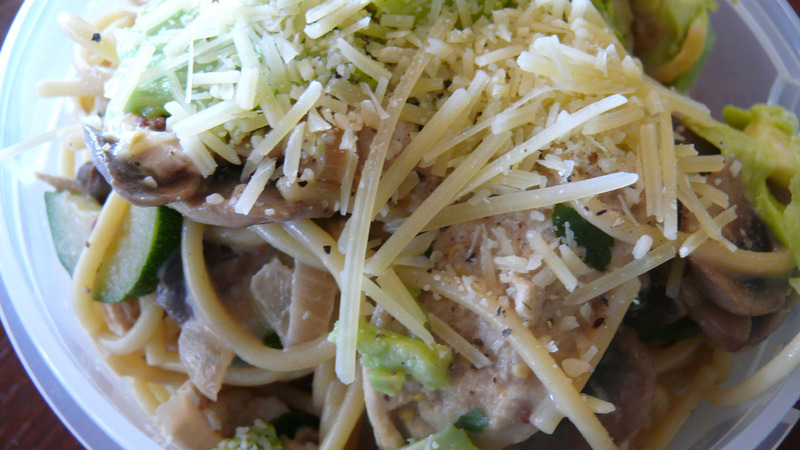 Creamy pastas, pesto pastas, tomato-based pastas, you name it, I’ll cook it. The only thing that doesn’t fly is when people add sweet chilli sauce to pasta (i.e., my boyfriend!) That’s just not happening in my kitchen. I’m a purist. Sue me. 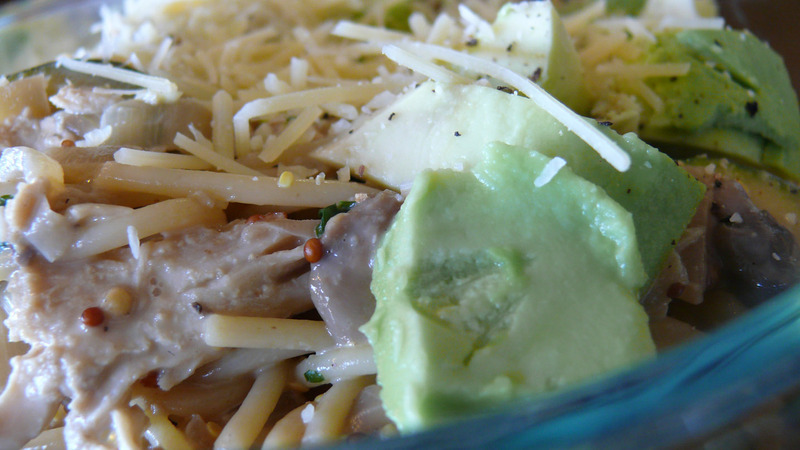 On the menu today is my slightly healthier chicken, avocado and mushroom pasta. I’ve modified a Taste recipe because when I saw the kilojoules per serve I had a mini heart attack. And I’m not one to shy away from calorie-laden meals! This recipe is best served fresh, but if, like me, you are constantly cooking meals to be reheated later, it’s still delicious. 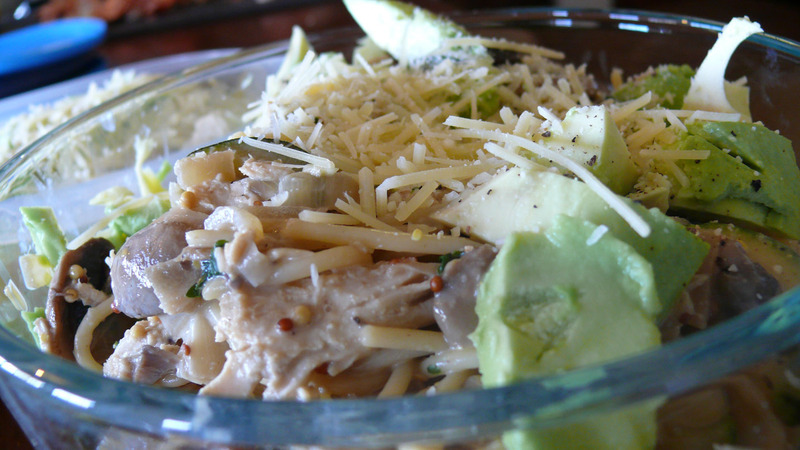 Just make sure you add your avocado last or use a hass avocado. Someone once told me they don’t brown as easily. Apologies about the ho-hum pics. I was indeed cooking this for dinner and as virtually all my dinners are eaten at a computer screen at my desk at work, I have our meals put into takeaway containers. LL was supposed to have dinner with me at my work so that’s why one of the servings is particularly massive! I usually try to portion our meals so I eat roughly 50g of pasta per serve and he eats 100g. 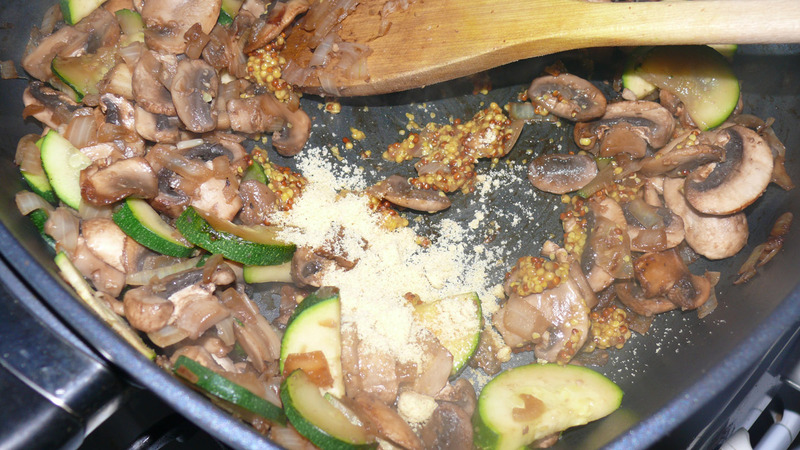 I am no weight loss guru, by any stretch, but you really can’t notice the reduction in the amount of pasta when you pad your meals out with hearty veggies, like mushrooms! Feel free to adjust those portions as you need. Enjoy! 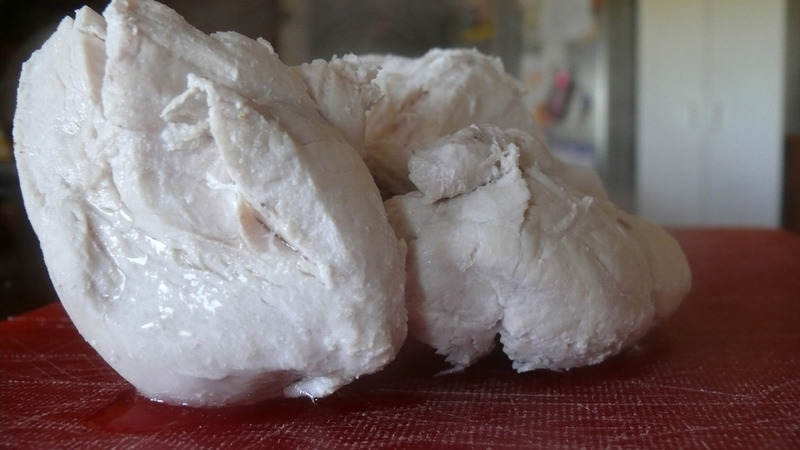 Poach chicken breast: place chicken breast in small saucepan with tight-fitting lid. 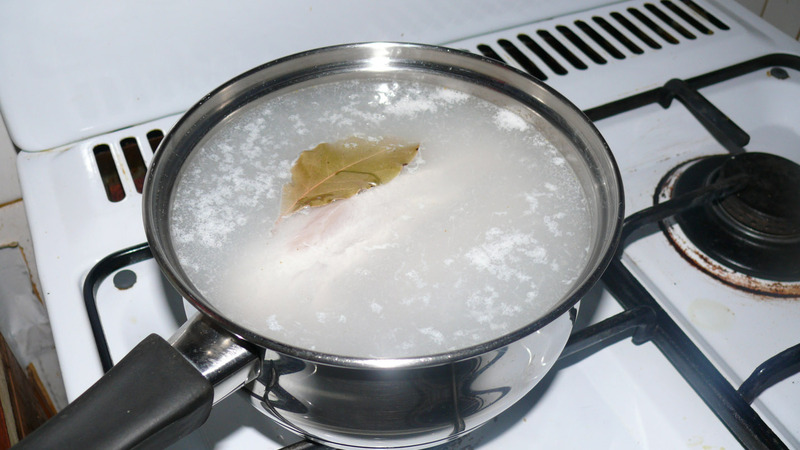 Add cold water to cover, bay leaf and stock powder (if desired). Bring to boil, reduce heat and simmer, partly covered, for 10 minutes. Remove from heat and cover. Set aside for 10-15 minutes. Drain and cover to keep warm. Meanwhile, cook pasta according to packet instructions. Drain. Heat deep frying pan over high heat. Spray with olive oil. Cook onion and garlic until softened. 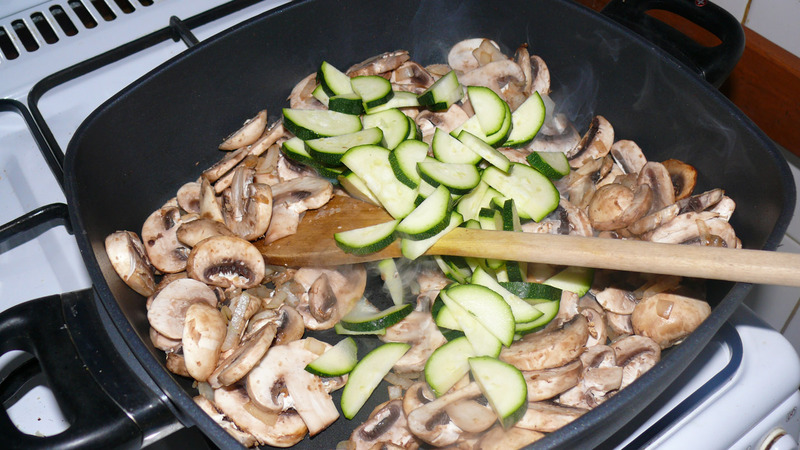 Add mushrooms and zucchini and cook for 5 minutes or until tender. Add mustard, stock powder and evaporated milk. 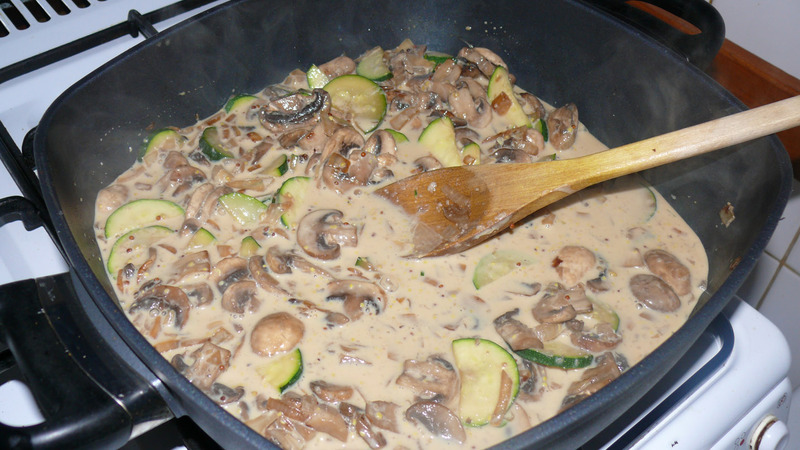 Reduce heat to moderate and simmer for 10 minutes or until sauce thickens slightly. 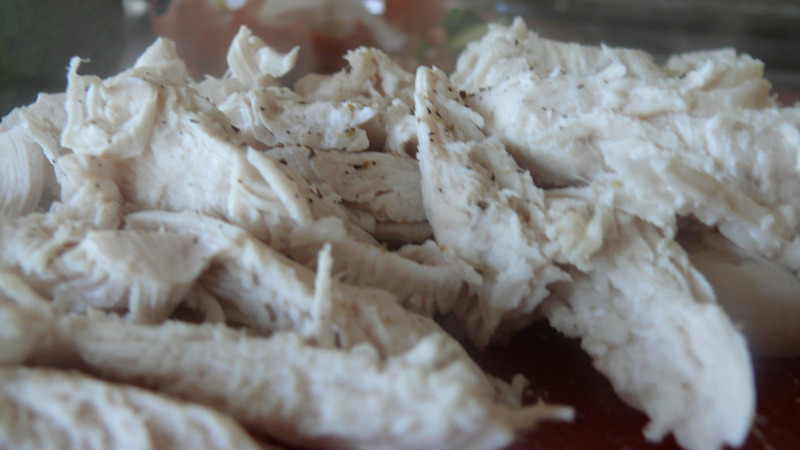 Slice chicken across grain and season with pepper. Add to sauce and add to pasta. Toss until combined. 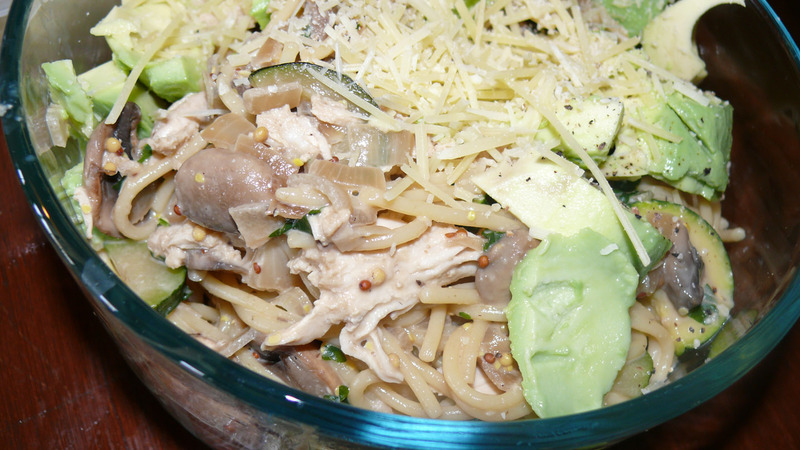 Carefully add avocado and herbs. Serve with a sprinkling of parmesan and cracked pepper.